RULES-You can only use one hand to place a piece. 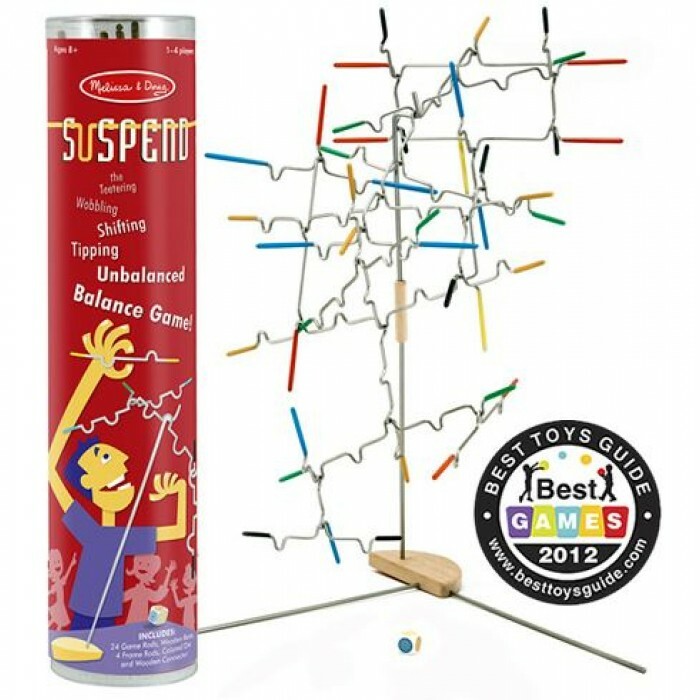 If you touch any of the suspended game pieces with your other hand during your turn, you have to take back your piece, and you lose your turn.-Once you remove your hand from the piece, the move is complete.-You can hang your piece from any part of another game piece EXCEPT a spot (notch or straight section) that is already occupied. (But if you hang your piece on an open notch or straight section and it slides to an occupied spot, that is allowed. )-Determine at the beginning of the game whether the wooden connector will be in play as a hanging point.-If you hang a piece that causes a part of the structure to touch the play surface, you have to reposition your piece.-If you cause one or more pieces to fall, you have to pick them up and add them to your pile. Play ideas for different levels available from Melissa & Doug! 8 years + recommended and my family has been having a fantastic time playing this game!! One lucky reader will win their own copy of Suspend! Pictionary! Too bad I can't draw. My favorite game is monopoly! Risk! The whole family plays it! Love the game of Life! I Love The Game Of Life Yahtzee And Monopoly The Whole Family Plays. My favorite game is Scattergories! At the moment my favorite game is Rummikub. My favorite game is Scrabble. I love word games! Thank you for the chance to win! My favorite games are Clue, Scrabble, Jenga and Candy Land. Thank you for the chance to win! Right now we are loving clue! I love Twister or Uno! We just had a table full of UNO players on Thanksgiving.We also like SCRABBLE. I like the game of Life!